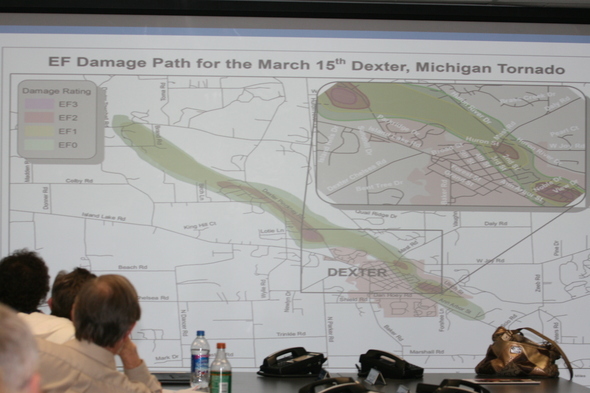 Posted on Tue, Apr 3, 2012 : 11:22 a.m.
Marc Breckenridge, director of the Washtenaw County Sheriff Emergency Services Division, shows a map of the March 15 EF-3 tornado that ripped through the Village of Dexter and Dexter Township. Editor's Note: This is another of a series of stories about the Washtenaw County Sheriff’s Office Citizen’s Police Academy classes, which take a close look at all the areas under the office’s jurisdiction. While residents in Dexter and Dexter Township were experiencing the wrath of an EF-3 tornado on March 15, Marc Breckenridge was in a cement bunker, helping to direct the county’s emergency response to the natural disaster. Breckenridge, director of the county’s Emergency Operations, said 13 homes were destroyed, 23 sustained major damage and another 185 homes were affected by the tornado, which caused about $3.754 million in damages. Four businesses also were destroyed. While residents were seeking cover in basements, under stairwells and in interior closets, Breckenridge was safe in the emergency operations’ ‘war room,’ located in the basement of the Washtenaw County Sheriff’s Office on Hogback Road. Marc Breckenridge, director of emergency services, in a secure room that contains specialized equipment. The room has no windows and is constructed of thick walls to protect the people and the many computer screens and specialized equipment that are part of the county’s emergency operations. 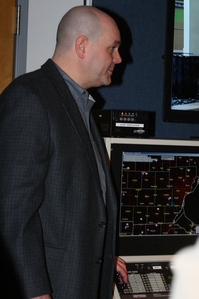 On March 15, he said, thanks to the work of some of the 538 trained Skywarn spotters, the county’s Emergency Operations Center was able to warn local officials well before the impending tornado carved a half-mile path through areas in Dexter and Dexter Township. Sarah Taylor, county dispatch operations coordinator, said about 1,400 calls per day are answered by 911 operators. On March 15 from 5-9 p.m. more than 800 calls came in, including about 354 911 calls. Breckenridge said he was able to activate the emergency warning sirens “across the northern tier townships,” and set in motion a plan that alerted first responders, area hospitals, schools and banks of the possibility of a tornado. He said near the affected areas, there are two outdoor sirens in Dexter Village, one each at nearby Portage Lake in Dexter Township, a siren at Parker and Jackson roads and another at Jackson and Baker roads. In total, there are 39 outdoor emergency warning sirens, which cost about $20,000 each plus a $500 yearly maintenance fee. And for those who can’t hear them, Breckenridge said “there are limits to their output,” he said. At one time, the county was purchasing two per year with grant funding but in 2009, that funding was cut, he said. However, “Webster Township is looking at a possible millage to purchase two sirens,” he said. “Convective weather (which includes severe winds, lightning, tornadoes and hailstorms) is the county’s No. 1 hazard,” Breckenridge said, adding it’s so dangerous because there is nothing that can be done to stop it. No. 2 on the hazard list is transportation-related hazardous materials incidents, while No. 3 is fixed site hazardous waste incidents followed by severe weather hazards such as ice, sleet and snowstorms. Breckenridge said a lot of planning has gone into the most effective ways to deal with emergency situations such as severe weather events and hazardous material incidents before, during, and after an event throughout the county. Breckenridge said residents should purchase a weather radio, have a three-day supply of water per person, which amounts to 1 gallon per person, and have a family emergency supply kit packed for emergencies. A map of the March 15 tornado damage path. 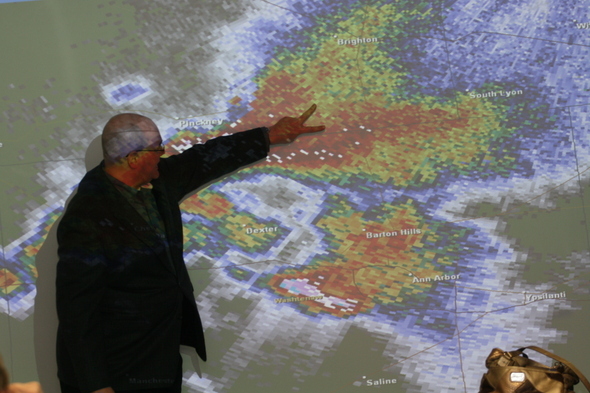 Wed, Apr 4, 2012 : 1:23 p.m.
For a *great* in-depth look at the role Skywarn weather spotters played, please listen to this interview with Lucy Ann Lance: http://lucyannlance.com/?p=19455 It's the last interview on the page. Well worth the time to listen, and hear &quot;the rest of the story&quot;. Wed, Apr 4, 2012 : 3:18 a.m.
&quot;Breckenridge said residents should purchase a NOLA weather radio, have a three-day supply of water per person, which amounts to 1 gallon per person, and have a family emergency supply kit packed for emergencies.&quot; A NOLA weather radio? Why on earth would we need to know about the weather in New Orleans, here in Ann Arbor? I'll stick to the weather information provided by the National Oceanic and Atmospheric Administration, or NOAA, as we call it. Wed, Apr 4, 2012 : 12:13 a.m.
Can someone tell me why the national weather service issued a tornado warning for Ann Arbor at about 6 :14 and the siren near Dexter &amp; Maple went off about 6: 40. Tue, Apr 3, 2012 : 10:17 p.m.
Where can I see that map? I would love a print of it to frame in my damaged home and pole barn. Tue, Apr 3, 2012 : 4:31 p.m.
First of all I believe Mr. Breckenridge was in a concrete bunker, not a cement bunker. Portland cement is a component of concrete. Common mistake. Second, I firmly believe that the sirens saved lives. I'm a short distance west of Dexter and could clearly hear the sirens, though no basement here. I'm still waiting to read when Dexter-Pinkney between Island Lake and Wiley will re-open. Tue, Apr 3, 2012 : 4:07 p.m. Sat, Apr 7, 2012 : 5:08 p.m. It would make a lot of sense to force developers to pay for new sirens when they build and rapidly increase the density of a population. Sirens save lives and are as important as any other infrastructure. Wed, Apr 4, 2012 : 11:01 a.m.
Buy a weather radio with S.A.M.E. Interesting insight in to emergency operations, but on reading the headline I was really hoping this article would be focused more on how well our emergency personnel felt they were able to respond with the resources they have. This event was certainly not a &quot;worst case scenario&quot;. One tornado in Dexter, heavy property damage but no deaths or injuries, some flash flooding in Ann Arbor, and a garage fire from a downed power line. I had to be out just after the storm, and it seems like every emergency vehicle in the area was out scrambling to cover small emergencies. What I'm curious to know is how much did this event push the limits of our county and local emergency services? Would they have been capable of suitable response had the tornado struck a more populated area, caused more injuries, or if there had been one or two more fires, or if the rain lasted another half hour and the flooding been worse? In this time where we are cutting our emergency personnel so far down to &quot;fair weather levels&quot;, events like this should serve as a gauge to determine how well we can handle real emergencies when they arise, and a wake up call if it looks like our services may be insufficient when most needed. Fri, Apr 6, 2012 : 8:21 p.m.
amlive - interested in your story about park place flooding. all info confidential. contact me at reddog494949@hotmail.com if you will discuss. appreciate any help. Thanks.